Cathi and I love to work in the woods. 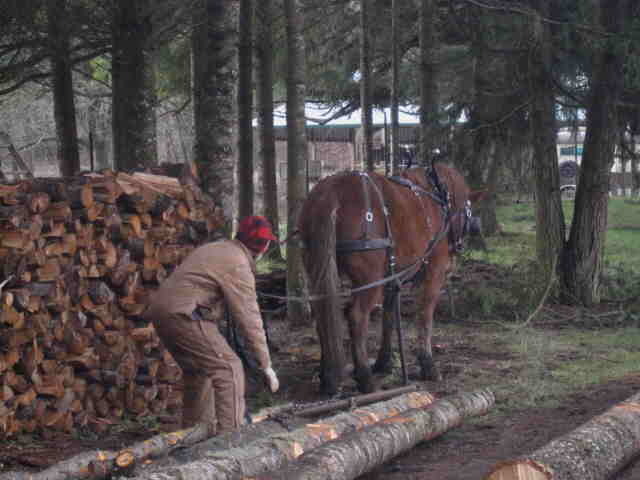 It’s even better if we can work with our horses in the woods. 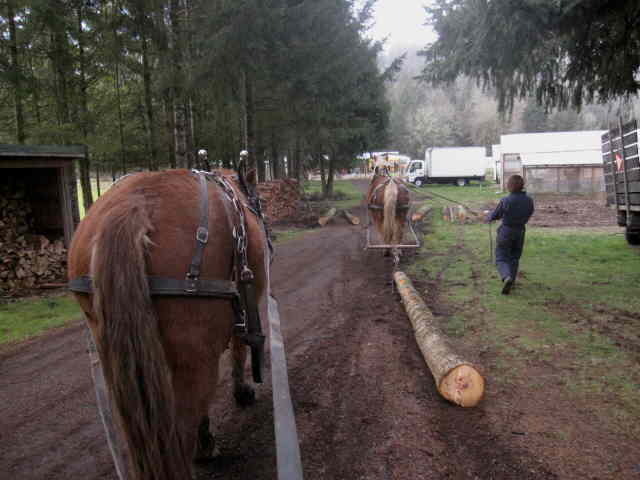 On March 8 we had some fire wood logs ready to skid out and each of us took a horse to do the job. 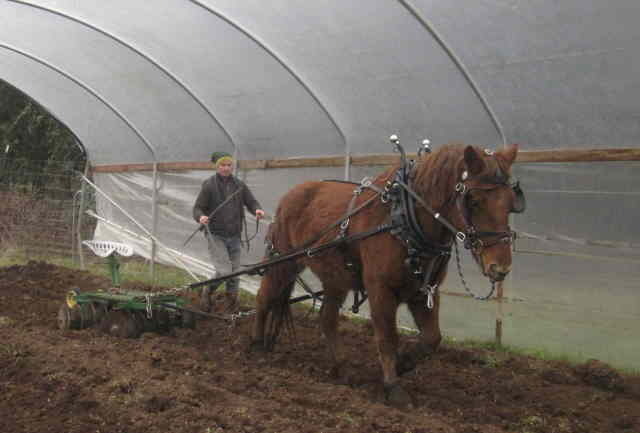 Here we have Kate and Ann, our Suffolk Punch Draft Horses. Kate was very relaxed, comfortable, and interested as I prepared the first log to hook to her. However, when she started off with the first small “warm up” log she became a bit anxious and was not very responsive to my attempts to calm her and slow her down. As so often happens, a training opportunity (not a problem) presented itself. 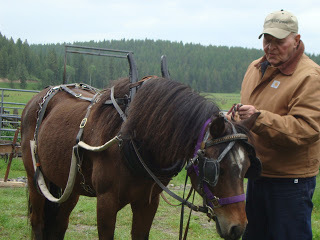 After stopping several times, letting her relax, and then attempting to start her again in a more relaxed and easy way I realized she was not able to control her anxiousness. I was not willing to hold Kate back with the excessive force that would have been necessary I asked Cathi to bring Ann over and drive her in front of Kate – to set an example of a relaxed and comfortable working pace. 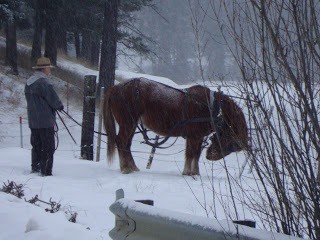 Not to mention creating a moving physical barrier as we each drove our respective horse down the skid trail. 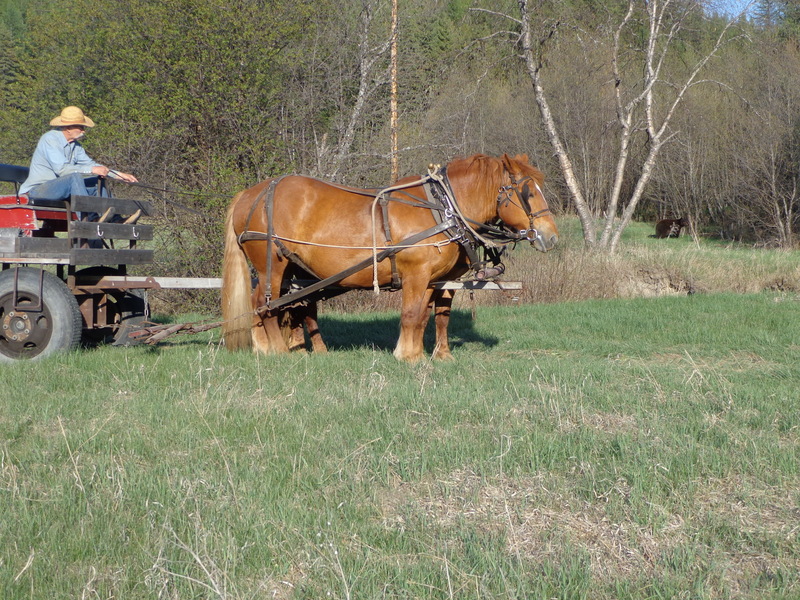 Kate was not happy with the slower pace initially. However, once she realized she would not be allowed to go around (“pass”) Ann she started to relax and accept the job on my terms. We made it difficult for her to do the “wrong” thing and easy for her to do the “right” thing. 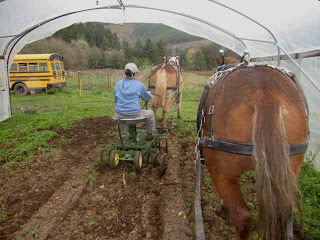 Thanks to Cathi and Ann I was able to avoid heavy pressure and harshness on the bit in order to get the job started at a safe and comfortable pace. It doesn’t matter that Kate has done this type of pulling in a relaxed way many times before, what is important is that for whatever reason (and they always have a good reason as far as they are concerned) she became anxious on this particular day, in this particular location, at this particular job. Rather than fight with her we used some gentle “creative horsemanship”. While ground driving, Doc noticed that Katey reacted fearfully in a familiar area. She had been through the area many times in the past, however, Doc knew she had not seen or been in the area covered with snow, and she had never seen the newly installed snow-covered sign at the side of the gate. Kate’s fearful reaction to this sign told Doc what he and Kate needed to focus on in that moment. This photo shows Doc encouraging Kate to examine the sign. He gave her the consideration to gather her own information about this sign. Doc lets her see and smell the object that caused her to worry. 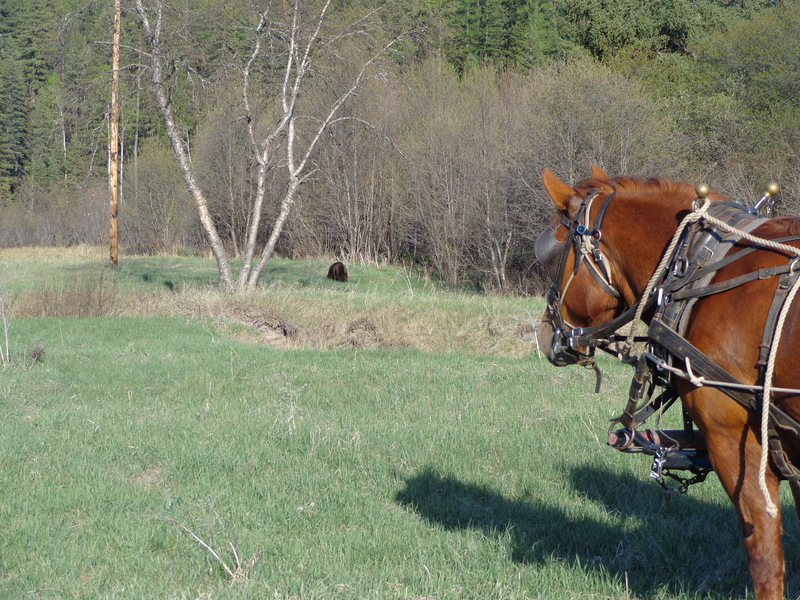 Rather than force her to approach the object or ignore her concerns (which could create more fear or greater concern for the horse), Doc allowed Kate the choice to check it out, take a closer look and gain understanding. Giving our horses the opportunity to check out a worrisome object, helps their understanding that this thing need not be feared, therefore building the horse’s confidence and trust. A wonderful chapter has opened in Paige’s driving career this week. She has become comfortable with a vehicle behind her, as well as a human or two being in the vehicle. She has been hooked to this vehicle as well as the single two wheeled cart, but has never been comfortable in the past. This is rather an involved story, but it is a great one! Last week, after returning from the Natural Gait, I noticed Paige and Val (our most talented helper horse), looking for each other and occasionally calling to each other. 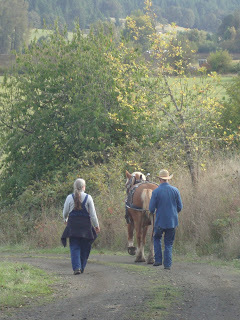 Both Val and Paige made the trip to The Natural Gait, but did not work together while there. They also traveled in separate trailers. The closest they got was being paddocked in adjacent paddocks. These paddocks are about 15 feet apart. Somehow they got to talking to each other. So, on Monday evening this week, I decided to try to put them together in a large paddock overnight. 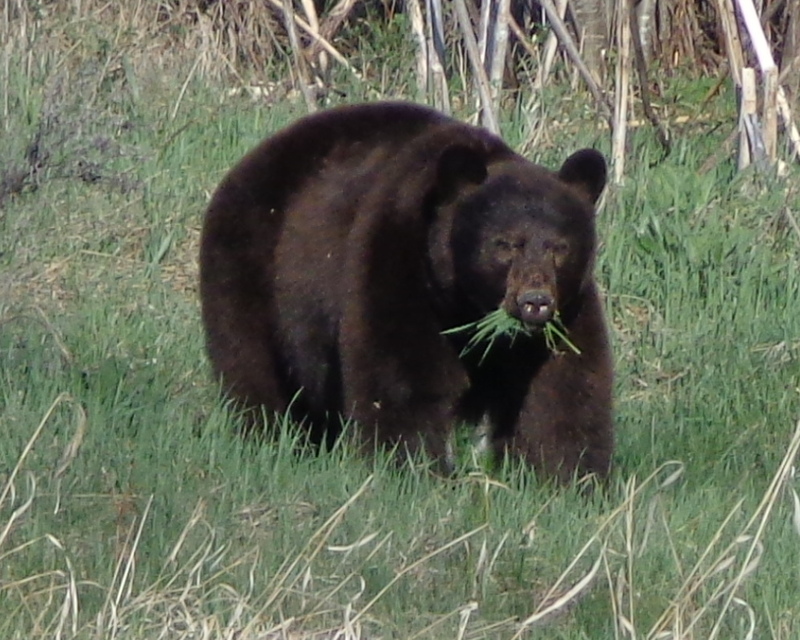 They calmly said hello, went to separate piles of hay, and began to eat. I watched a while a went to the house. About 1:30 in the morning a loud horse argument was in progress, so I got out of bed and headed out to investigate. 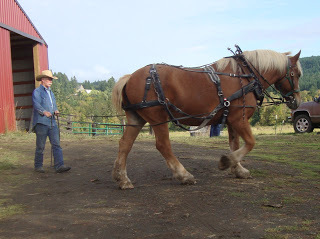 When I got to the paddock, the two horses were standing very close to each other, and both were resting a hind leg. When I went into the pen, Paige got very vocal as I approached Val. A very Low voice, but very intense. Val had no marks but, Paige had two significant marks. One from a set of teeth, and one from a glancing hoof. She let me investigate them, but swished her tail at me as I got my hands close to them. They were sore. I watched the two of them for about an hour, and twice during that time, I began to catch Val to move her out to another, adjacent paddock. Paige nearly put herself in between Val and me, and talked in that low voice. (Very interesting,She controls from a subordinate position in the herd). Finally I added a bit more hay, the first piles were not completed, and went back to bed. Tuesday morning, when I pulled Val out to go into her day stall, Paige and Val both began calling and looking for the other. They called and fidgeted for 2 hours, ignoring hay!! 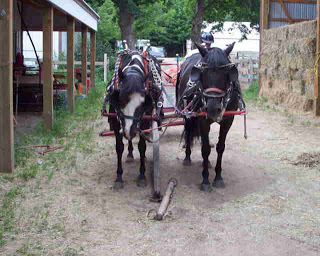 Finally, I harnessed Val and brought her to the barn where Paige was still calling every 30 seconds, and both went silent. Next we harnessed Paige in a farm harness. She has not worn a farm harness in over two months. I put them together and they walked out of the barn as calm and quiet as any old team would. Once outside we hooked to a team stone boat and they drove around for about an hour with calm, steady steps, quiet stands, and just plain a sense of calm all the while. For Paige, that is way longer than in the past. 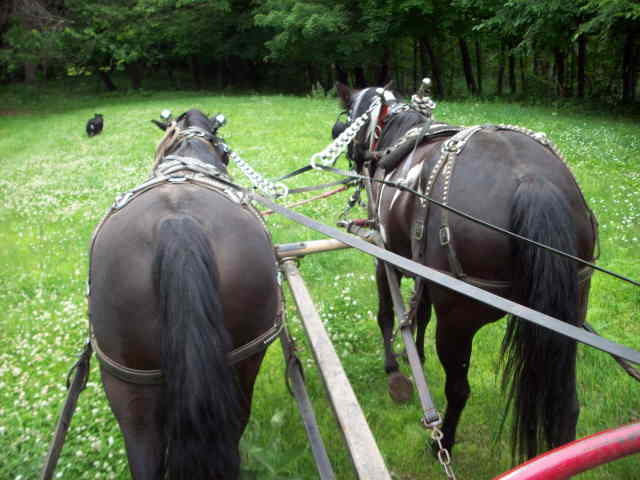 Tuesday night they paddocked together, and Wednesday’s driving was a monumental day! 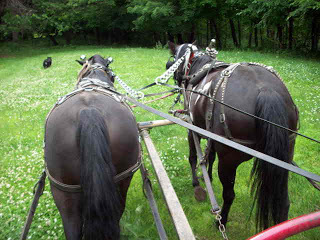 We harnessed in farm harness, and walked out to the waiting Fore-cart. We had Paige step over the tongue, and she stepped over like an old pro! We stood still, and then walked away calmly when I asked for them to walk. This weird sense of calm is still here, so I just stepped them over the tongue again, and they stood perfectly still for lifting the tongue, and then hitching to the eveners. I stepped up into the seat and wiggled it around a bit. I asked the team to walk and they stepped out together, and walked around the woods for about an hour. What a joy! 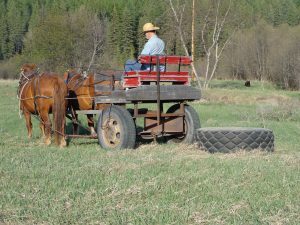 When I returned to the barn, a loaded spreader caught my eye. 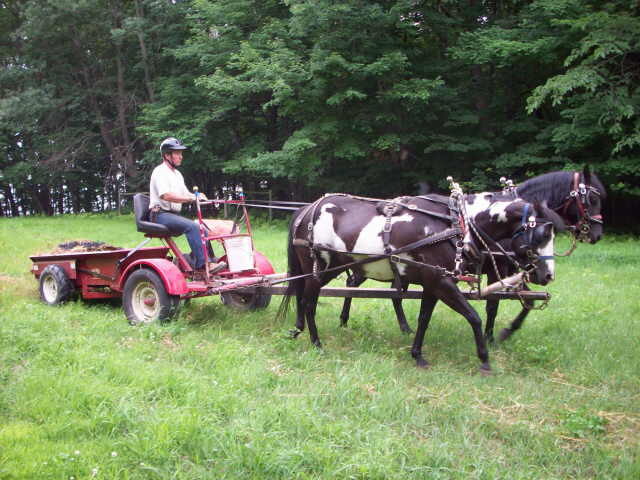 We stopped, backed up to the spreader, stood still, hooked onto the spreader, and walked off calmly when asked. Can you believe it??? 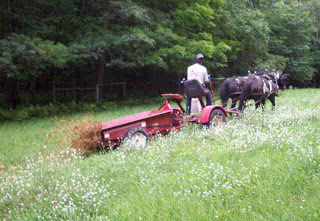 We walked out to an unused pasture, and stopped to put the spreader in gear. Still calm. When I asked them to step forward, Paige was bit quicker than Val, and kept leaning on the collar until Val joined in. That is Big Time Comfortable Horse behavior!!! As we unloaded I just could not contain Myself, and I called Karen while we walked calmly down the pasture. 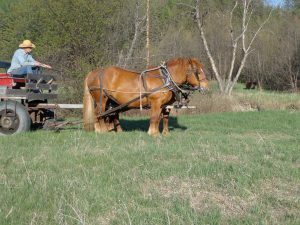 We finished the load, I disengaged the spreader, and then continued to talk to Karen as we oh so calmly walked back to the barn through the woods. There was no one to take a picture. Today we had Cathy home to get photos, so we did it all again. What a day! Thank you all for your part in this story. Team Paige has many members who helped us find a few of the pieces to this 1000 piece jigsaw puzzle. 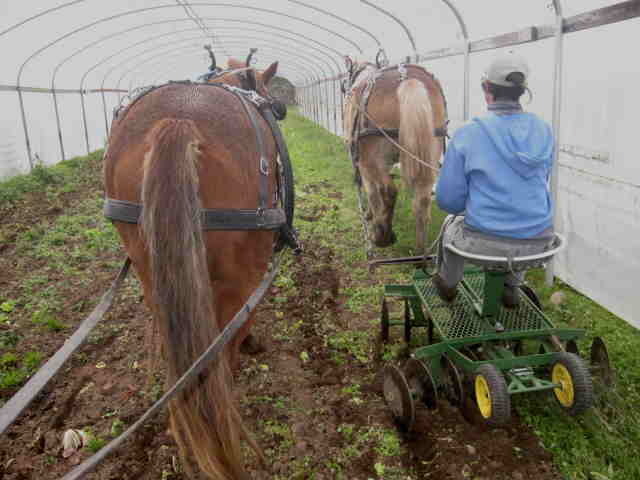 Come out for a wagon ride someday in the near future and see your project in action.